You need six reasons to see Six? How about this: Catherine of Aragon, Anne Boleyn, Jane Seymour, Anne of Cleves, Kathryn Howard, and Katherine Parr. Okay, joke aside, what’s better than a musical consisting of six queens? Let’s start this again. Characters – Everyone knows about Henry VIII’s six wives right? 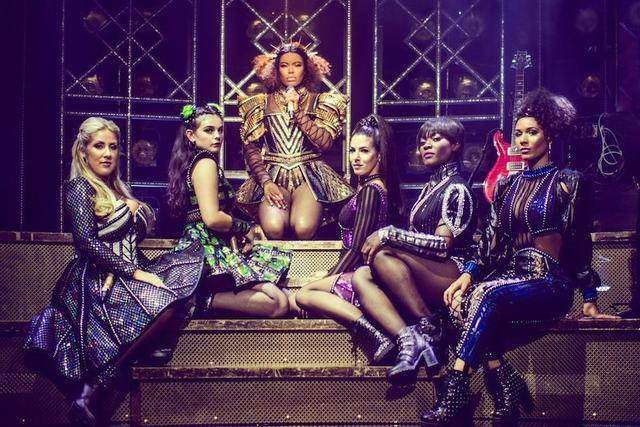 They’re kind of legendary in British history and we all learned about them at school at some point, but in this musical, these queens are reimagined and brought to life in a whole new way. It’s no longer HIStory but HERstory and it makes for the coolest history lesson probably ever. In this production, these characters are made up of their truthful backstories and presented with a contemporary mix and of course great songs. Style – In this sense, I’m not actually talking about the costumes, which are fabulous by the way, but the premise of this musical being a concert. A musical about Henry VIII’s six wives could have actually gone a number of ways but the direction they chose was certainly different and makes this production stand out, in a superb way, the style making it super contemporary and instantly likeable. Songs – The numbers in this musical wouldn’t be out of place in the Top 40 music charts today. These pop princesses.. sorry, queens, certainly could be the next great girl band. Sorry, Little Mix, move over for SIX. From their group songs to their solos, the Queens shine, as do their numbers. Each song has its own style, suited to its queen, and couldn’t have been written more perfectly. They’re all complete hits and you’ll find yourself singing them and desperately wanting to listen again (a few are on Spotify, just FYI). Story – You think you know this story already? Well you’ve not heard it like this before. We all know about their one thing in common and not much about the wives but that changes in this musical story. It’s definitely a brilliant way to get the other side of the story, or should I say the six other stories. Cast – Now, whilst this musical is certainly a creative bit of genius, it would lie flat if it didn’t have an amazing cast to back this up. Each one of these wonderful women have a beyond stunning voice, each of them could certainly move into the music industry, if this girl band like production has given them a taste for that field. All embody their roles with everything they’ve got and really pull you under the spell that they are their characters, without a second thought. Girl power – This incredible girl band, SIX, certainly give off Spice Girl vibes, and girl power is certainly a big element of this show. These queens and their all-female band shine in their own light. No longer in the shadow of their husband, looking at you Henry, they come together and teach us their HERstory. Six is currently booking until 14 October at the Arts Theatre. Book SIX tickets now!